Erie Tiger Wrestlers Conquer Holy Family and Frederick in the Same Night! 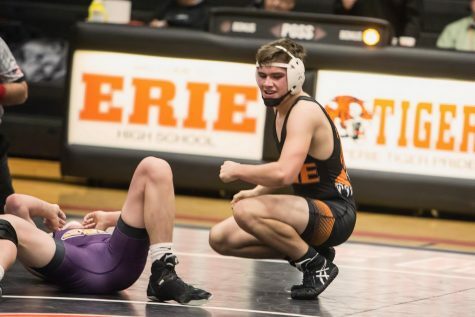 The wrestling mats rolled out onto the Erie High School gym floor as Holy Family wrestlers walked in to face the Erie Tigers on Friday night. Erie started out strong with a string of victories as Tanner David, wrestling at 138 lbs, secured a six point lead with a pin on Holy Family’s Jackson Fuller within the first 43 seconds. Karsten Odom (145 lbs) earned another 6 points in 52 seconds with a pin on Brandon Alvarado. Branson Roylance (152 lbs) kept the trend going by pinning Joe Zaminski at 1 minute and 48 seconds. After a stream of fast pins by the Erie Tigers, Dominic Barela (182 lbs) was caught in a tight match with Benton Daniels. After being thrown into overtime, Barela had a takedown from the back and secured his win. Noah Lopez (106 lbs) came out flying as he faced Holy Family’s Matt McCarthy. Lopez’s first takedown was easy with an armbar and wore McCarthy out with relentless moves, pinning McCarthy after 5 minutes and 11 seconds. Older brother Rudy Lopez (120 lbs) faced Chris Florez and pinned him after multiple takedowns. Gus Fonseca-Walker (126 lbs) faced Adam Bartoletta and after staying in control after a double leg takedown he secured a 10-0 win. And the final Erie win for the match resulted in Luke Ellis (120 lbs) pinning Connor Leigh at 1 minute and 9 seconds. Erie triumphed over Holy Family at 54-12 but the sweet taste of victory was not gone quite yet. After Frederick had their turn at Holy Family, they faced Erie in the final duel of the night. Witt Unruh (160 lbs) kicked the match off with a bang as he took six points with a pin in the second period. The next victory came with Alonzo Warner (195 lbs) as he persisted in multiple takedowns on Frederick’s Austin Ojeda and pinned him in the second period at 2 minutes and 31 seconds. Excitement arrived with Noah Lopez’s tight match against Carillo. Each wrestler was well matched for each other and Lopez stayed in control as they rolled across the mat, fighting to get leverage on the other. The match was peppered with Lopez’s takedowns and reversals, and remained exciting as Lopez’s speed began to frustrate Carillo. The match ended in Lopez winning 6-4. But the Lopez v. Carillo battle was not over. In the next match, Rudy Lopez, Noah’s brother went against Gabe Carillo. The match began with Lopez in trouble as Carillo went for his legs and had him on his back for a few seconds. But Lopez quickly locked into gear and began having takedowns and reversals on Carillo that were returned. Lopez fought to get Carillo on his back and finally touched both shoulders to the mat at 3 minutes and 19 seconds. Gus Fonseca-Walker wrestled Cody Ayers. Throughout the match blood time outs occurred often as Fonseca-Walker’s cuts were opened and reopened. However, Fonseca-Walker stayed in control and won 6-2. And finally Karsten Odom wrestled Brandon Andes, coming out with taking Andes’ legs and being in a takedown. Each wrestlers fought strong but Odom managed to stay on top. Reversal after reversal, Odom managed to pin Andes and contributed the last winning points to the final record of 36-32 Erie. After creaming Holy Family and taking the win from the Frederick match, victory tasted sweet on Friday night for the Erie High School wrestlers.